Replicating the beauty and elegance of vintage lace is made easy with this how-to book on the popular technique of Bruges lace. It is a style most often used in garment design because the pieces can be made in smaller sections or motifs then joined to make one large project or added to larger projects, making them portable and easy to incorporate multiple colors. 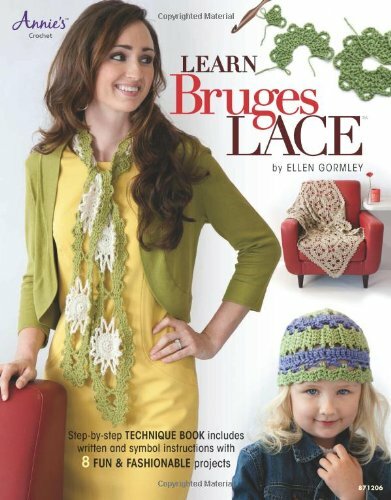 The greatest thing about modern Bruges lace is that amazing results are possible with very basic crochet stitches. This book includes eight beautiful designs with step-by-step photo instructions. DK, sport, and medium worsted-weight yarns are used to make these designs that both beginner and intermediate crocheters will love. Ellen Gormley has been crocheting for 12 years and is a member of the Southwest Ohio Crochet Guild. She lives in North Bend, Ohio.